On Wednesday 27th March six primary 7 pupils were invited to take part in the STEM challenge run by SENTINUS. The Primary stem challenge is a hugely enjoyable problem solving challenge for teams of three pupils. 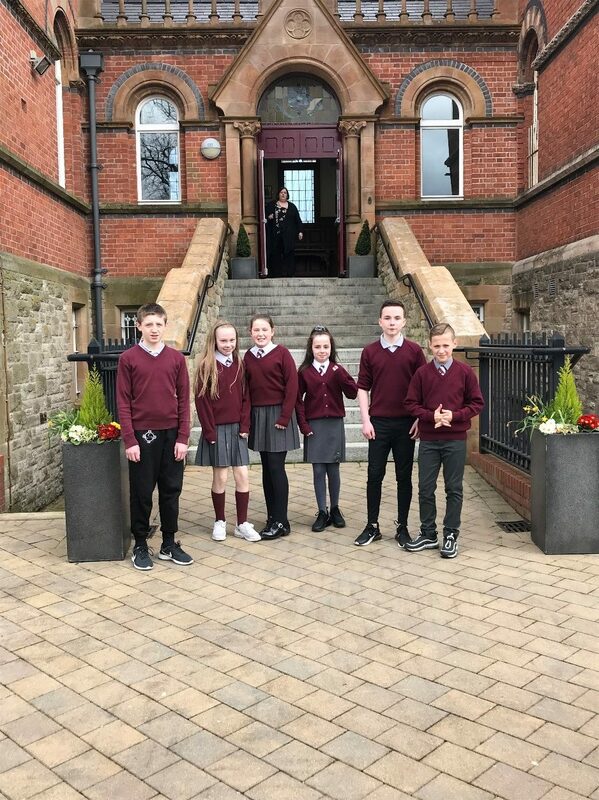 The two Holy Trinity teams entered were up against some stiff competition from different primary schools across Belfast. Using basic technology materials, the pupils were required to design and build a solution in a set time. This year the children had to design a car that would carry a load down a ramp and travel across the assembly floor. Both teams did extremely well and represented themselves and the school with great distinction. Holy Trinity P5 children had a fantastic couple of days planting flowers before Mother’s Day. Children from P1-P7 and LSC too were all involved and made 290 beautiful planters all for their mums and grannies! The children chose their flowers and containers before planting in soil and adding a Mother’s Day message. A huge thank you to everyone who bought Mother’s Day Planters to raise money for Trocaire and other charities. A big thank you to Mr Hackett for organising this fun project! We hope you all have a lovely day on Sunday! Our P7s had a great morning yesterday at the Hive Hackers Award Ceremony in the Waterfront Hall.This was a great coding programme that our P7s all took part in and PwC helped them to develop their skills through algorithms, sequencing, debugging, repeat and loop commands. Well done P7s and a big thank you to PwC. 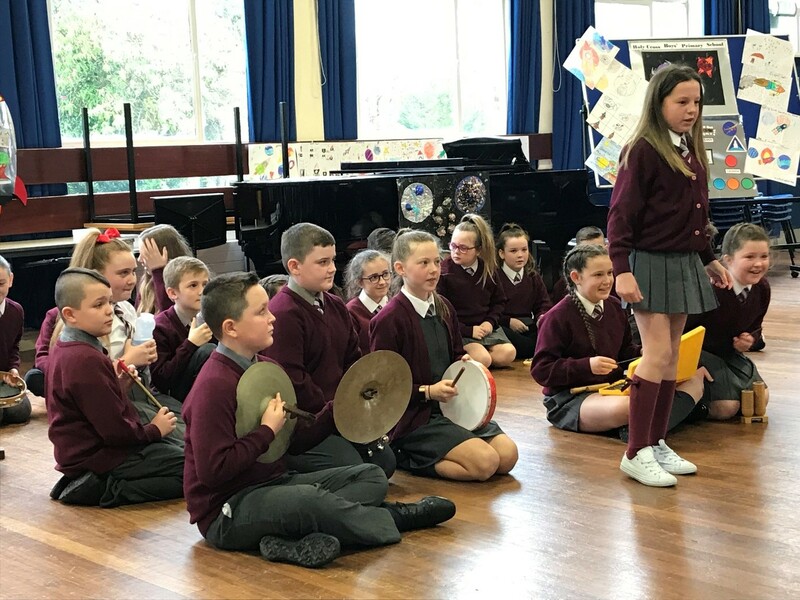 On Friday 22nd March P7LM were invited to attend Music Morning in Fortwilliam School of Music alongside four other schools. The boys and girls had to learn words to five different songs and chants. These songs and chants were accompanied with instruments or actions and all children had the opportunity to play an instrument. The pupils also had to come up with a musical compilation that represented the rocket taking off and visiting three different planets. They performed extremely well on the day and participated enthusiastically. Click the photograph to see us sing. A huge well done to all our brilliant Primary 3s who made their First penance yesterday. We were so proud of you all! Holy Trinity P.S. are once again organising a sale of MOTHER’S DAY FLOWERS to raise money for TROCAIRE. We have a SPECIAL DEAL on planters INDIVIDUALLY MADE by your own child.Take advantage of this once in a year chance and book a Mother’s Day treat for the amazing price of £6.50. Your child can collect an order form in school.